We let our extended families know a few weeks in advance that we would not be joining them for Easter. We did not over-explain or give excuses. There is no need for that if you and your husband are on the same page about what is best for your family. 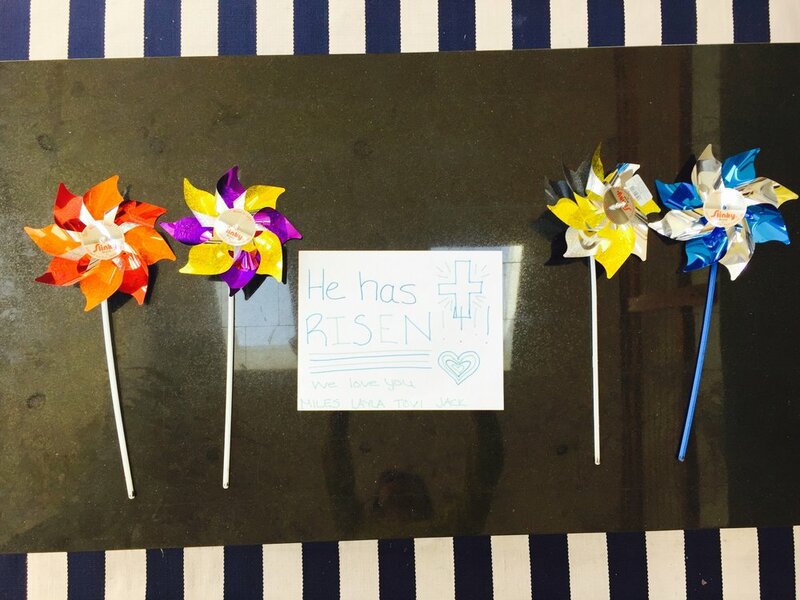 In the morning, our children came downstairs to find pinwheels and a note. We don’t do Easter baskets because we don’t feel they are necessary. We might give each child a small gift, but that is it. They are always excited for whatever they get. My daughter and I like waking up early to make a special breakfast on holidays, so we had a nice breakfast together before heading out the door for church. I like the dressing-up part of Easter. Nobody got a new outfit, but we did dress up for church. 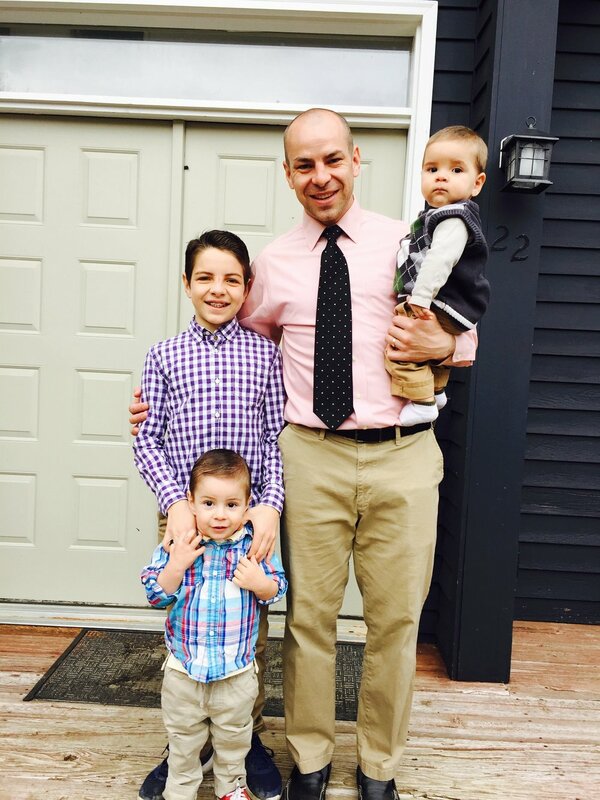 Here are our family photos of us with our children on the porch heading off to church. 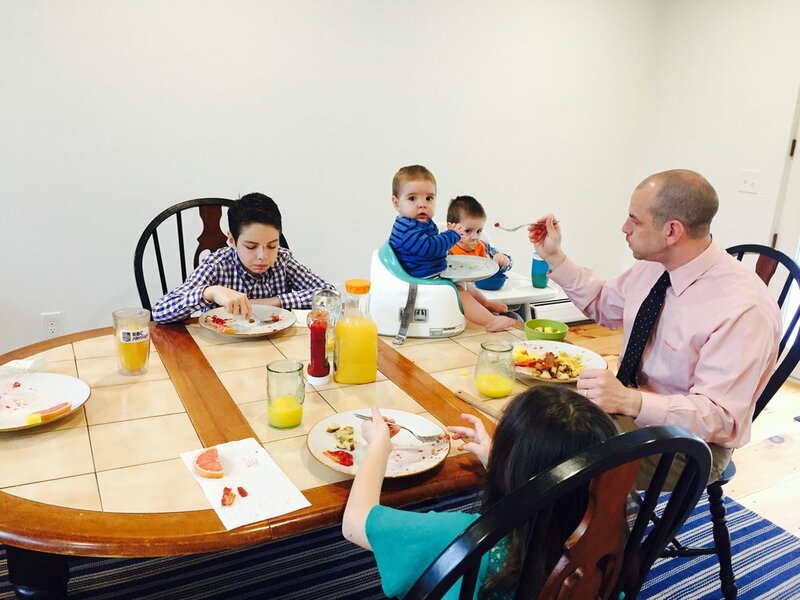 After church we came home and put our little boys down for a nap, and then began working together to prepare our “Easter Meal”, which was ham, mashed potatoes, gravy, salad, pineapple and maybe one or two other fixings. I’m fuzzy on the details here- what I had prepared the day before, what jobs each person did (or how much they actually helped, haha), or whether we ate before or after the boys woke up. No matter. The point is that we didn’t go over-the-top with food and kept things pretty simple. 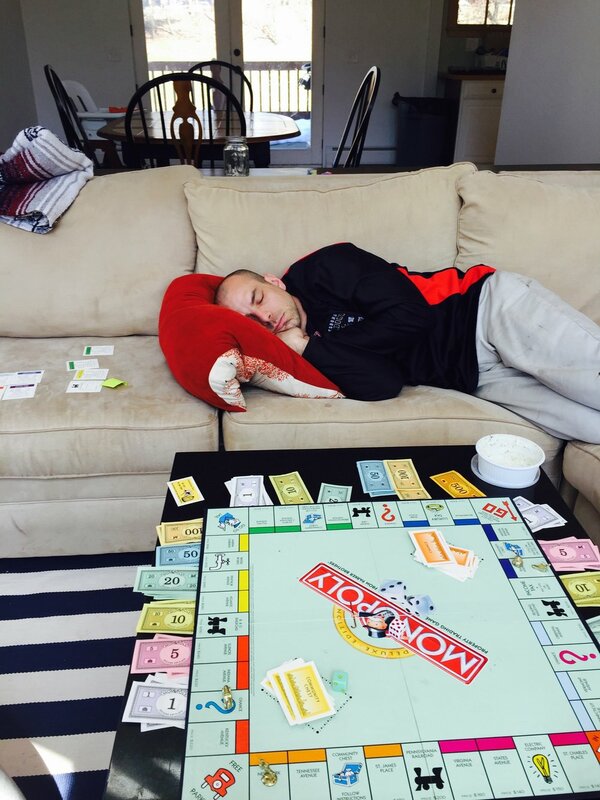 While the little ones were down for their nap, we played a game of Monopoly with the big kids. Daddy fell asleep. 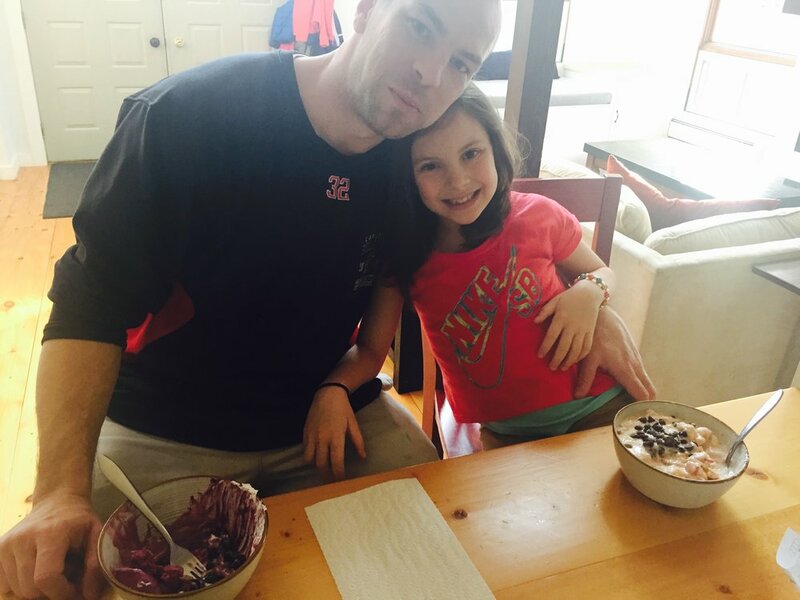 And this photo tells me that at some point Layla and Daddy made smoothie bowls (their favorite). The best part about the day was that it was spent together, making memories and having quality time with our children. 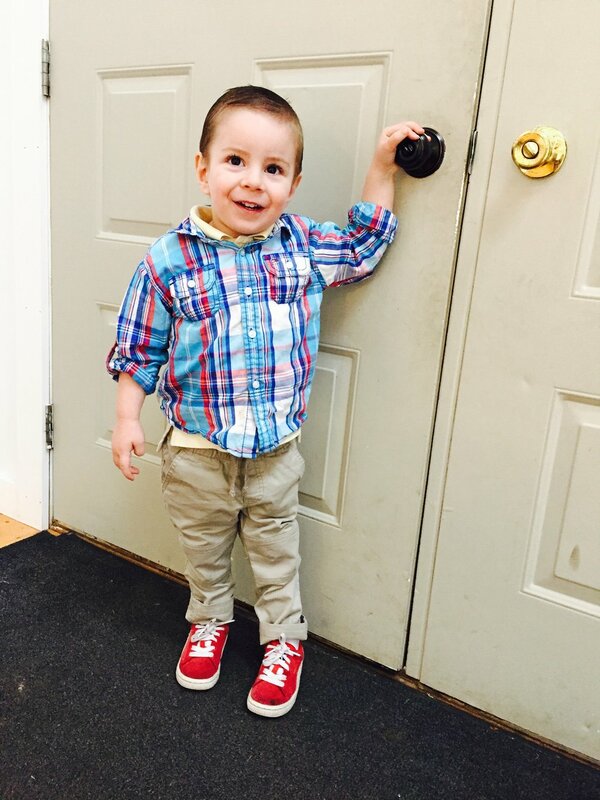 All they ever want is for Mommy and Daddy to slow down, pay attention and engage with them. It is sad that it might actually take a holiday to make that happen; but on this particular holiday, that is exactly what we decided to do. We said “no thank you” to others, and “yes” to the most important people in our lives. We kept things simple so that we could enjoy what matters. We took small opportunities to thank Jesus and talk about what He did for us- but really, we try to do that in our lives everyday. The point is that you do not need a formula, a how-to-guide, or a lot of money to have a special, simple Easter. Just plan a few special things and spend time with the ones you love!